Side note before I jump into the tree...we awoke Saturday morning to record snowfall in the DC area. 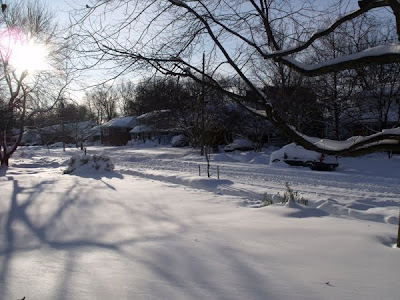 We have about 18" of snow on the ground (a ton for us)...and I say have because we still have it! It made for a beautiful weekend...major props to Carter who volunteered to go round up my girlfriends so the girls didn't have to drive in the snow and our brunch could go on! (I know...MAJOR husband points) The rest of the weekend, we hunkered down with neighbors and had several neighborhood dinners and snowed-in cocktails...it was a wonderful way to enjoy the snow! Duh, duh, duh, DUUUHH.....The AO Tree!! As you may recall, the plan was to switch from our previous burgundy/gold color scheme over to something that would match the beautiful greens of the new house. 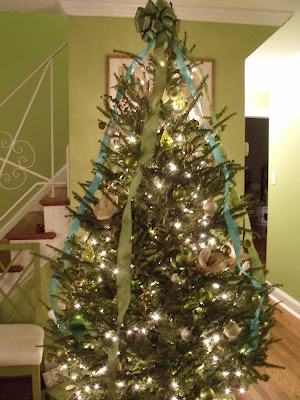 Since this summer, I have surreptitiously been collecting ornaments to go with this new green scheme...a pack here, a set there...so Carter wouldn't notice...and before I knew it, I had a whole tree's-worth of green-themed ornaments! 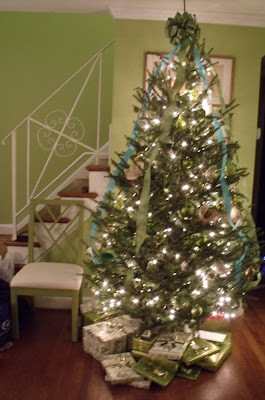 And to accent all the green finery, I kissed the tree with some turquoise. 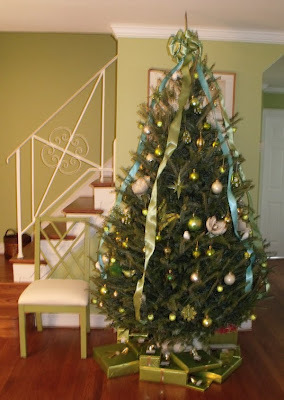 It's a bit hard to see the ornaments in these pictures, but I got some adorable pear-shaped lime-colored glass ornaments with white polka-dots this summer...you can kind of see one next to that spherical vertical striped ornament, which is definitely my absolute favorite. The striped ornament is part of a set I found in South Carolina. I also have these fabulous glittered magnolias that I found at Michael's last Christmas...I fell in love with them and bought a whole bunch that I stick into the tree and use elsewhere in the room. 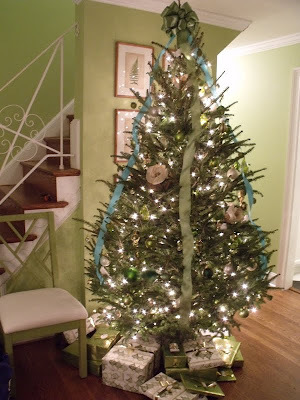 If I can give one "tip" about Christmas trees, it is to tuck flowers in them. I know it sounds a bit odd, and if you are anti anything fake and floral that tip is probably not for you, but craft stores have some really beautiful fake florals for holiday arranging and I absolutely LOVE how the big sparkly blossoms look tucked in the branches of a tree. 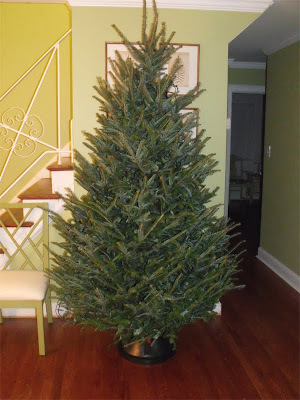 And, they make a big impact in those bare spots on your tree that you can't quite fill with an ornament. I'm hoping to pick up some fluffy green hydrangeas next year and tuck those into the tree (if I can find room!). WOW--I LOVE IT!!! 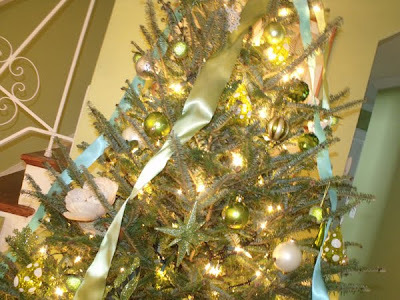 I think the ribbon is my favorite...next year I am so doing that! I've never thought to look at HomeGoods for wrapping paper. Must do that THIS year!! And boy is your husband the biggest sweetheart ever! Thanks Erin! HG definitely has some good wrapping paper finds...and yes, Carter won the husband of the year award. The tree looks just beautiful! I love the green color of your walls. Can you tell me what color that is? Ironically, I have a burgundy and gold color scheme however the green is also a favorite color of mine. I recently did a white/lime green tablescape that would look beautiful with this room. I've often thought of changing my color scheme as well. 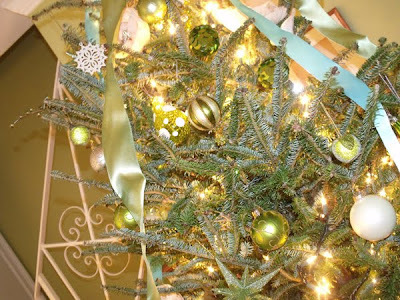 I have a ton of ornaments with lime green as well as white/silver and gold. This year, I've also tucked some white roses into my tree. I really like the way it looks.